The town had been known as Turkey Creek and was once a part of Dawson County. The first settler was Celeste Pingenot from Castroville who opened a stagecoach depot. Pingenot named his business “The Wallace Inn” after his friend - Texas Ranger “Bigfoot” Wallace, who was carrying mail on the San Antonio to El Paso route. Bigfoot, Texas would later be named after Wallace. 1878: Post office opens and Turkey Creek becomes Wallace with Pingenot as postmaster. 1880: August Cline came to town and worked for Pingenot., learning the duties of postmaster. 1881: The Texas and New Orleans Railroad came through the area. 1882: the population rises to 75 people. 1883 Cline became postmaster and changed the name of the post office to Cline, Texas. 1920s and 30s: The Uvalde Rock Asphalt Paving Company was active enough to have the railroad run a spur from Cline to the mines at Blewett and Dabney – about 16 and 20 miles away, respectively. Today Cline is not shown on the maps, even detailed county maps. There is an estimated population of 10 and several structures (the Pingenot House is one). 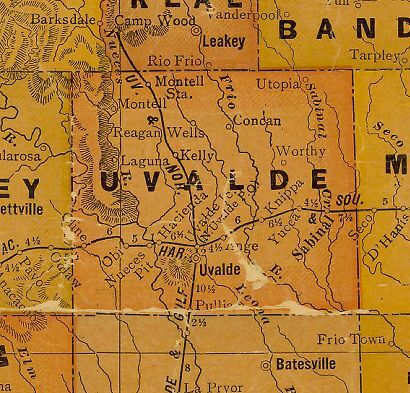 1920s Uvalde County map showing Cline.